Scramble the eggs to sort & match! 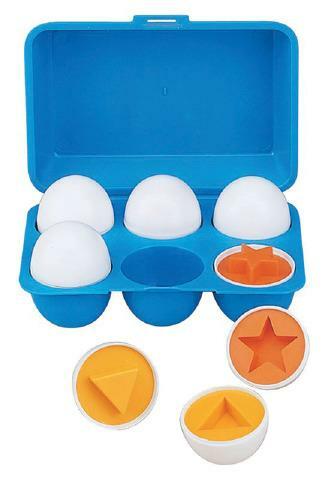 Combine sorting and matching skills with pretend play with this "eggs-cellent" set of eggs in a cute, carry-along carton! Correctly match shapes to make two halves of an egg form a whole. Dimensions: L: 11" x W: 4" x H: 4"
This fun toy adds an element of math to dramatic play and gives an opportunity for discussion as students "cook". The difficulty comes when the shapes sometimes get stuck in the carton, but it can be a problem solving opportunity.